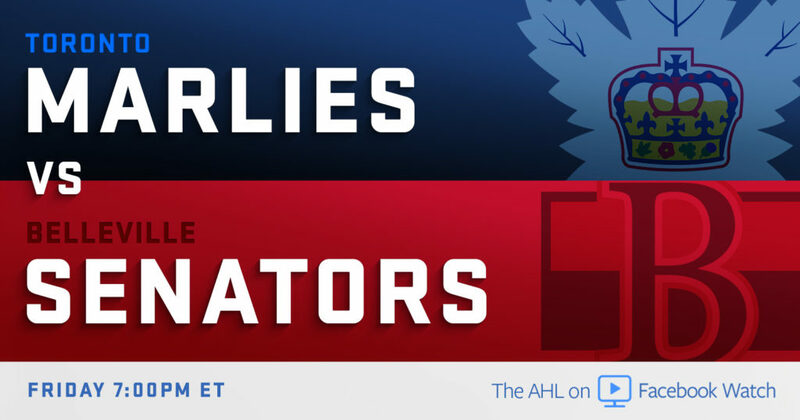 The Belleville Senators will be featured on Facebook Watch Friday night as fans around the world can watch the Sens’ contest against the Toronto Marlies. It will be the first time the Senators will be broadcast live on Facebook Watch as part of the AHL’s agreement with the streaming company. The game starts at 7pm Friday and can be streamed by clicking here. Jack Miller will be on the call while Paul Svoboda will provide colour. Less than 800 tickets remain for both games this weekend against Toronto. To purchase tickets visit the Senators’ Box Office, call 1-855-985-5000 or click here.